You guysssssss!! I've been bursting at the seams to share this with you since I found out about it and am so happy to finally do so! It's safe to say I've completely fallen in love with D.C. since moving here two years ago. So when I had the chance to team up with the organizers of Ball on the Mall, I jumped at the opportunity! 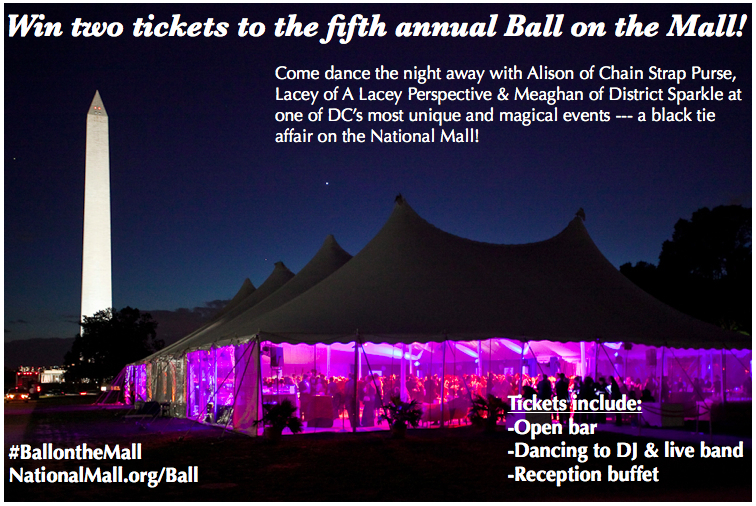 Here's the deal: Ball on the Mall is an event put on by the Trust for the National Mall and raises money to keep our little slice of history looking fabulous. Between the hundreds of thousands who come from around the world every year to visit and those of us who live here and just like to take the occasional stroll around the monuments, it's no wonder it needs a little TLC. And for the past four years, Ball on the Mall has been helping generate funds to ensure it stays looking pristine! And the event itself is nothing less than amazing! Cocktails, dancing, black tie attire all under a tent in the center of the mall with a view of the Washington Monument and the Capitol building (see pictures from last year's event here). Does it get any more incredible? The answer is yes, actually, because I've brought fellow blogger friends Lacey and Meaghan on board and together we've teamed up to give away a pair of tickets! 1. You must be available to attend the ball on Saturday, May 4, 2013. 2. Tickets include open bar, dancing, and a reception buffet from 8-11:30 p.m.
3. This is a black tie affair, so you and your guest should dress for the occasion! 4. Must be 21 years or older to enter. 5. Transportation to and from the event is not provided. To enter, simply leave a comment below! You can also leave a comment on Lacey or Meaghan's blog, but remember that it's only one entry per person. You may enter between now and Thursday at 11:59 p.m. The winner will receive two ball tickets and will be announced at noon on Friday! Good luck and I can't wait to party it up with the winner! P.S. If you're free that day and don't want to leave your attendance at Ball of the Mall up to chance, you can secure your place at this fabulous event by purchasing a ticket! It's truly a magical evening you'll remember for a lifetime! This sounds like an amazing event! I would love to be the winner of a pair of tickets! I never pass up chances to get all dolled up. Fabulous giveaway! 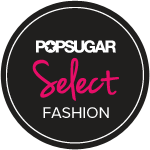 Thanks for including your readers! I wonder what you will wear. Great giveaway! Can't wait to see pictures. OMG I would absolutely love to go! I've been scheming to get my boyfriend in a bowtie for months so this sounds perfect. UM yes!!! I would love to go!!! This looks amazing! I'd love to come. Ummmm yes please! I wanna go so badly! What a great event! I follow your blog and Lacey's religiously and I would LOVE to get to meet you! OMG this sounds like SO much fun!!! Here's hoping I win!!!! What a great giveaway! I think it would be a blast to attend-- plus it's a great excuse to buy a new dress! Fingers crossed!! Thanks for the giveaway! Signing up! This sounds like such a fabulous event for such a great cause! I'd love to get dressed up and attend in style. Thanks Alison! I have lived here four years and never knew about this- i hope I win because it would be fabulous to see my husband dressed to the nines in a beautiful tux! I would love the opportunity to get dolled up and enjoy the best views in the city! What a great opportunity to do something fun, yet be worthwhile to a vital cause. A special night indeed! What an awesome idea for a blog... Here's to hoping! The pictures look incredible! So amazing! D.C. is my heart and home! I would love to be able to go! It sounds so fun! I really hope that I win this! I ended up missing the inaugural balls due to tragedy in my family, so I would love to be able to wear the formal I got for it and support the mall!